At the end of last month Ben Kraftwerx & Idol Eyes brought their guitar based experimental sounds on a 2 week tour of the Pacific Northwest. Sonically exploring the area by car, boat and bicycle, the duo performed in alternative spaces and coffee shops across Oregon and Washington State. Stopping in places like Port Townsend, Bellingham, Portland and Corvallis, they also managed to perform live on InternetTemple.org and record quite a bit of material during the downtime. Ben Kraftwerx played experimental acoustic guitar tracks off his recent release parsnips while weaving bits and pieces of sound collage into his sets. Working in an improvised manner he re-arranged classical melodies and de-tuned fingerstyle guitar arrangements into frenetic yet relaxing soundscapes. Idol Eyes turned on the amps and performed electric sets of layered guitar tones and hazy psychedelia. Playing tunes from his entire catalogue (and a skronk version of Maggot Brain), he created walls of guitar riffs and fields of reverb with an array of guitar pedals and samplers. There was an awesome merch booth with a tour-only CD-r of various experimental recordings both artists had made together with different projects. I think there are a few left, if I find them I'll put them on Discogs. Also included was a physical print of the textual cutup Blacksmith at Smugglers Mine by Ben Kraftwerx as well as tapes of Jiya Dhareka by Idol Eyes and the Southwest Circular tape too! For the grand finale, the duo performed together as the hybrid act "CO-V.A.L.I.S" when they performed at Corvallis Experiments in Noise XXIII at Interzone Inc. 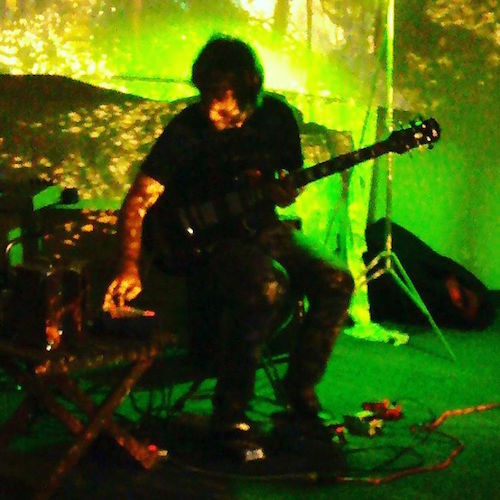 They played slide guitars and homemade electronics while improvising over fragmented samples of previous compositions. Some practice sessions for this event were recorded and will hopefully see the light of day in some form of release in the future.